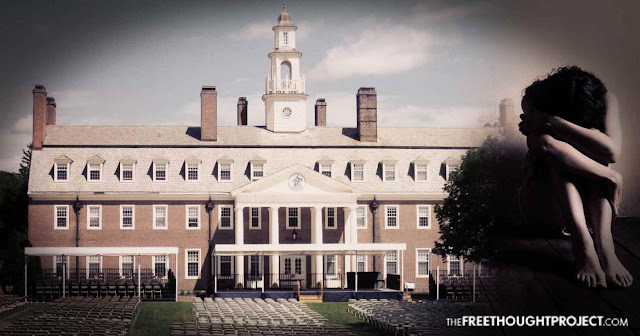 (Jack Burns) After a female student contracted herpes from her English teacher, parents of the girl, who sent her to Choate Rosemary Hall, in Wallingford, Connecticut, filed a grievance with the elite boarding school. The incident was just one of dozens dating back to the 1960’s, according to a report released by the school this week. On another occasion, a “Spanish teacher named Jaime Rivera-Murillo is said to have raped a 17-year-old student in a swimming pool after drinking heavily with a group of students.” Murillo was “fired for ‘just cause,” but he went on to work at several other Connecticut schools, including as the principal of a high school in Litchfield County. He resigned from that post this month after the Choate investigator contacted him and the district superintendent,” writes the New York Times. In a letter co-authored by Michael J. Carr ’76 Chair, Board of Trustees and Alex Curtis, the school’s Headmaster, the two discussed how the investigation into sexual misconduct at the school began. Sexual misconduct at Choate Rosemary first came to light in an October 2016 article published in the Boston Globe. The Globe interviewed Cheyenne Montgomery, an alumna from the class of 1992, who said her French teacher, Bjorn Runquist was engaged in a sexual relationship with her while she was a senior and he was her dorm advisor. She later told The New York Times it wasn’t the first time she’d been abused at the school. She said in an interview with the times, as a Sophomore, she was engaged in a physical relationship with her Math teacher, Angus Mairs, one she felt to be a boyfriend-girlfriend type of relationship. It was only after she confided in Mr. Runquist what had taken place with Mairs, that she began a sexual relationship with the French teacher. Montgomery told the Globe, “Choate chose to protect the perpetrator instead of the victim — and set up the potential for there to be future victims.” And indeed, there were more victims…many more. Key to Kestenbaum’s success would be participation from alumni. The letter states in previous correspondence, the school asked everyone to be forthcoming. “Perhaps most important, we asked you to share your experiences with Ms. Kestenbaum and her team so that we could learn as much as possible about historic instances of misconduct,” the letter reads. Transparency was something the school wasn’t used to, according to some of those closest to the knowledge of abuse taking place at the elite boarding school. Kestenbaum’s report has now been completed. In it, she described the school as actually fostering a climate whereby abuse could thrive. “Even when a teacher was terminated or resigned in the middle of the school year because he or she had engaged in sexual misconduct with a student, the rest of the faculty was told little and sometimes nothing about the teacher’s departure and, when told, was cautioned to say nothing about the situation if asked,” the report describes. Unfortunately, the law of averages will lead many to believe there are likely more victims who have not yet come forward. Of the 12 listed above, five are already dead and none except Runquist could be reached for comment. The former French teacher, now an outed predator, says his relationship with Montgomery was an “isolated” one and says it was an “extremely painful” time in his life. We at The Free Thought Project, believe, when it comes to child safety, apologies simply aren’t good enough. Not only do surviving adult victims of child predators need to be sufficiently compensated monetarily for their pain and suffering resulting from the dereliction of duty but school leaders also must face criminal prosecution for their crimes, no matter how old they are and what statute of limitations exist.